Does anyone have a good pic of Randi from Monday's event at the Magic Castle that I could use on my blog? Not crazy about the pic I have. Happy to give credit and a link, etc. Thanks. You can email me via my contact page (don't send a message via the Genii system because, for some reason, I can't reply). the book "Conjuring" which was published in Dec. 1992, 1st edition by Randi. It is a beautiful book, and if you do not have access to it I could scan it, (that is, if it is not a copyright violation), and email or fax it to you. Thanks guys. But, yeah, I was looking specifically for a pic of him at Monday's event. Was Najee there? Maybe he can help you? I just went ahead with the pic I have. Thanks anyway everyone. Here's my report (Houdini centric, of course). 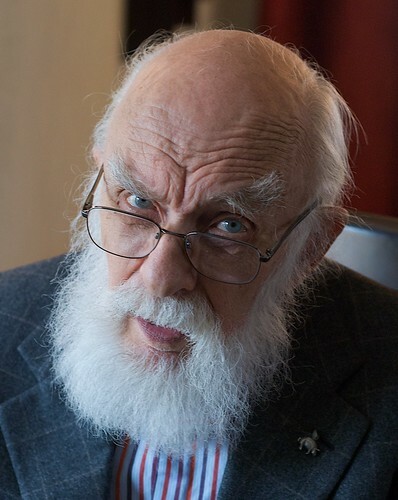 Randi is 83 years old. I did say that the Gresham bio has a lot of inaccuracies. But I also said it was, to me, the best of all the Houdini biographies. Did you say that about the Gresham book? I'm sorry I didn't include that. I'll add this in the comments. High praise indeed. For me, Silverman is the best, followed maybe by Christopher. But Gresham is right up there. JohnCox wrote: Did you say that about the Gresham book? I'm sorry I didn't include that. I'll add this in the comments. Hey Max, I went one better and added an asterisk and update to the blog post re you and the Gresham book. Sorry I didn't hear it the first time. I really should take notes at these kinds of things, but I didn't even plan to do a blog about this until the poster come out at the end. Thanks again. It was a great interview. I think that Gresham, as a novelist, captured a sense of what Houdini was like better than other biographers have done. His biography gives more space, proportionally, to Houdini's struggling days than do other bios, making it more of a dramatic story. My impression, probably from reading Gresham's "Monster Midway," is that Gresham always perceived Houdini as a type of carney. Houdini came from that background, as well as from childhood poverty, and made himself a star. That was his story. I also think that for some of us Gresham's bio is special because we read it when we were children. When I read Silverman's bio, I appreciated the scholarship and perspective. I could see it was a big step forward. But I didn't get a sense of excitement reading it. I recently re-read Christopher's bio of Houdini and was impressed. It was more interesting, detailed, and better written than I remembered. A very professional job. For some reason, his bio seems to get overlooked. Certainly Christopher was appreciated back in the day. It was really THE authoritative bio for many years. But now it doesn't really have the nostalgia factor of Kellock and Gresham and Silverman/Kalush have become to the new authoritative go-to sources so, yeah, a little overlooked these days. Speaking of Randi, I watched the doc "Houdini Never Died" last night and forgot that it has sensational footage of Randi escaping from a straightjacket while suspended above Niagara Falls. fyi--that Niagara Falls straight-jacket footage was taken from the (1970s) TV Special entitled "The World of Wizards". Randi was the on-camera host throughout; the special had a wide variety magicians performing on it. Randi did the UPSD jacket over Niagara while wearing a HOOD...so, as a surprise climax to the program - when the performer was lowered to the ground after the escape...it was revealed to be RANDI himself! To this day, Randi's straight-jacket was never found or returned to Randi - after he dropped it into the Niagara river below (he wrote his name & contact info. inside it). I was wondering about the hood. I thought it was maybe just to protect him from the cold, but I thought it was odd that we didn't at least see Randi at the start. Now it makes sense. Still, I liked the hood. Thought it was pretty effective. I also wondered if the jacket was ever recovered. Thanks, Joe. on FB. He might have others. Thanks, mai-ling. I've already done the blog post, and the pic I used worked fine.